How blessed we are to be comforted by one another in times of trouble and even more so to receive comfort from our Heavenly Father. Blessings to you! Amen! Thank you for reading and commenting my post, sis. Blessings to you as well. Amen! Thank you so much for reading my post. Blessings. Lovely post Karina. Thank you for sharing your thoughts with us. You are a blessing!!! Amen! A beautiful word of encouragement and hope…..with God nothing is impossible, in the good and the bad times, He remains faithful ~ I pray this family will continue to experience the comfort of the Holy Spirit in every way. Thanks for sharing. God bless!! Amen! You are welcome. Thank you for reading and commenting my post 🙂 Blessings to you. you are welcome, sis. Thank you for reading. Blessings and happy Thanksgiving. . Your are welcome. Thank you for reading and commenting my post. I really appreciate it. Blessing to you. Hi Karina, it looks like the Shepherd has been on both of our minds. I’ve been treasuring and meditating on this beautiful psalm most of this year. Thank you for sharing your thoughts on it! You are much welcome. Thank you for taking time reading my post 🙂 Blessing on your day. . This is one of my favorite scriptures! 🙂 Thank you, Karina! You are welcome. Thank you so much for reading my post:) Blessing to you. Sis, I am so sorry to hear of this loss. But when I hear of such great faith my heart soars. Psalm 23 is such a comforting Psalm. Thank you for writing about it. Blessings to you! Thank you so much for reading my post.. I have learned from my manager’s faith so inspired me to wrote a bit about Psalm 23. By the way, how are you. Hopefully everything will be good there..Blessings to you too. Amen! Thank you for reading my post 🙂 Blessing to you. You are right. Trust the goodness of God when trouble comes, not as easy as saying it. 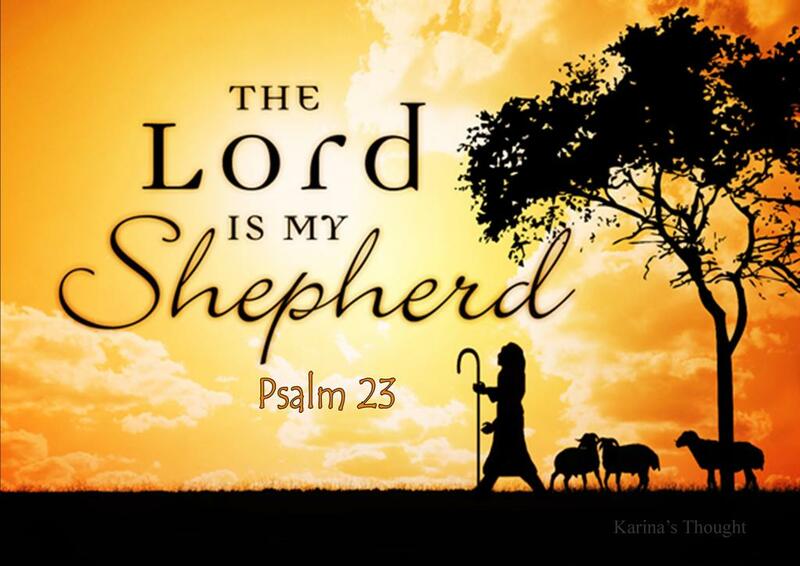 But God is our good Shepherd. The one of my favorite songs says : God is too wise to be mistaken, God is too good to be unkind, So when you don’t understand, When you don’t see His plan, When you can’t trace His hands, TRUST HIS HEART. Thank you very much you told about your mother 🙂 thank you for your comment. God bless. Thank you,sister Anna. God bless. I’m sorry don’t know about Aretha Franklin very well especially about her personal life. But yes it was so sad and ironic the gospel singer living in God. Thank you very much for reading my old post, sist. I really appreciate it. God Bless and have a wonderful new weekend.